If you follow the latest SEO trends, you are probably aware that RankBrain, Google’s AI-driven algorithm, is set to become even more powerful in 2018. Whether organic click-through rate (CTR) affects Google rankings is no longer a question. There is no doubt today—its influence is stronger than ever. CTR along with the dwell time (how long someone spends on your website) are two critical things that RankBrain focuses on. It’s pretty simple—the more clicks you attract with your search result, the more likely Google will give you a ranking boost. Our marketing team at Chanty was surprised to notice some of our articles around long-tail, low-competition keywords receiving a natural ranking boost with no additional efforts from our side. It turned out, once the article gets to the #1 search results page on Google, it skyrockets to the top if the click-through rate is above average. The spot your page gets in Google results could become a game changer. According to a recent study, the #1 search results in Google tend to get about one-fifth of all clicks. The top three results receive almost half (!) of all the clicks. With impressions → clicks → leads → sales funnel most companies are building their business around, the position switch from #5 to #1 may result in x4 revenue increase. Realizing the importance of CTR, we shifted focus to improving the way our website pages are presented in Google search results. In this blog, I’ll tell you about the five things we’ve done to increase our organic CTR and how you can apply those to your business moving forward. The ‘Content is a King’ trend is far from its sunset. In fact, it’s getting bigger each year. Although severe competition has taught marketers to write in-depth, engaging, educating and fun content, there are still a lot of irrelevant, auto-generated, ‘content for the sake of content’ results. It’s particularly true in the niche of communication software comparisons and the reviews we’ve chosen to compete with. No wonder that opinion-based, human-friendly articles like our We’ve Tried 4 Slack Alternatives during 4 Weeks (our Team Feedback) attract plenty of eyeballs. Adding words like ‘our experience’, ‘our feedback’, ‘we’ve tried’, ‘our team’, etc. allows us to resonate with our target audience and have a positive impact on CTR. After we adopted this trick, our team made sure to add a bit of personal flavor to all blog articles where it was applicable. Key Takeaway: Share your experience. Express an opinion of your own and reflect that opinion in your content, including the headline. Climbing to the Google top is absolutely crucial. Even if your page occupies the #1 spot, don’t relax just yet. Chances are the page snippet isn’t even visible till the user scrolls down. 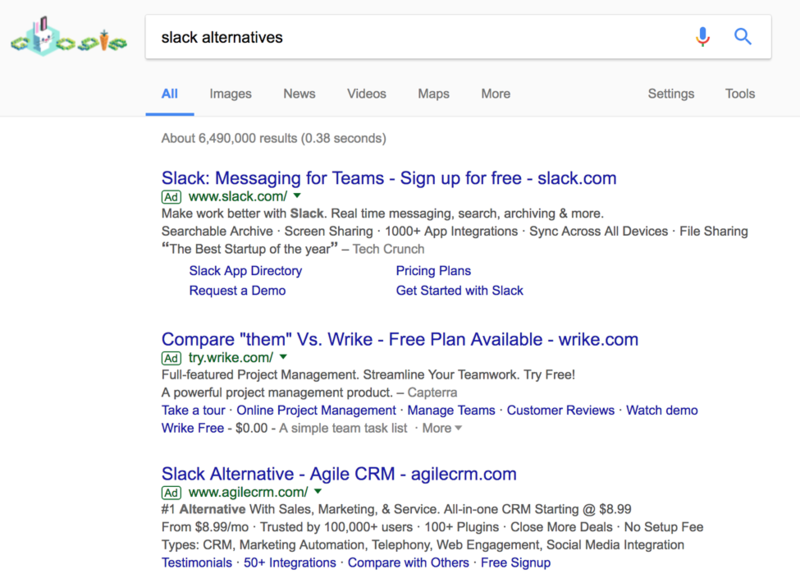 If you take a look at the first screen Google shows you for “Slack alternatives”, one of our target keywords, you can see the organic search results aren’t even there. As you scroll down, you may also see featured snippets—another reason you are experiencing traffic decline. Did you know that CTR for the first organic result falls below 20% if a featured snippet is present? When it comes to organic opportunity within Google, featured snippets are an opportunity to showcase your thought leadership. Be diligent with your keyword research and identify the ways that you can move into the featured snippet you’re looking to capture. Apart from featured snippets, there are many more ways for you to stand out. Brackets, numbers, special symbols like ‘&, @, %’ in the title can drive attention to your snippet and boost the click-through rate. Years ago, marketers were exposed to some studies claiming that headlines with numbers drive twice as many clicks than “how to” headlines. Or that odd-numbered headlines have a 20% better CTR than headlines with even numbers. Or that using brackets in headlines gives you a 38% CTR boost. The question is, are your competitors doing the same? It’s hard to appear different if the search results are packed up with your rivals doing exactly the same thing. Before publishing an article, take a look at the Google search results page for a keyword you are planning to target. Come up with a headline that is different from what everyone else is doing. If the titles abound with ‘7 Ways’, ‘12 Tips’ and ‘17 Tricks’, you should probably think of another way to attract attention. Consider even small differences like odd vs. even numbers or positive vs. negative sentiment. No, backlinks don’t affect your CTR directly. Let me begin from afar. Organic CTR is the ratio of organic clicks to impressions. It means that you need to have impressions in the first place. Obviously, you won’t get many impressions if your site appears on the Google search results page #7. A few impressions result in even fewer clicks. Even if you have the best CTR in the world, chances are there won’t be enough data for Google to analyze and push your result to the top. That’s where backlinks come in handy. High-quality domains pointing to your site signal Google to give your site a boost and voila—improvement! Of course, there are many more ranking factors, but backlinks are by far among the most important. Once you get to the first page, you can start fighting that CTR battle. We’ve noticed that once the site gets to the first Google search results page, its position number is no longer about backlinks. 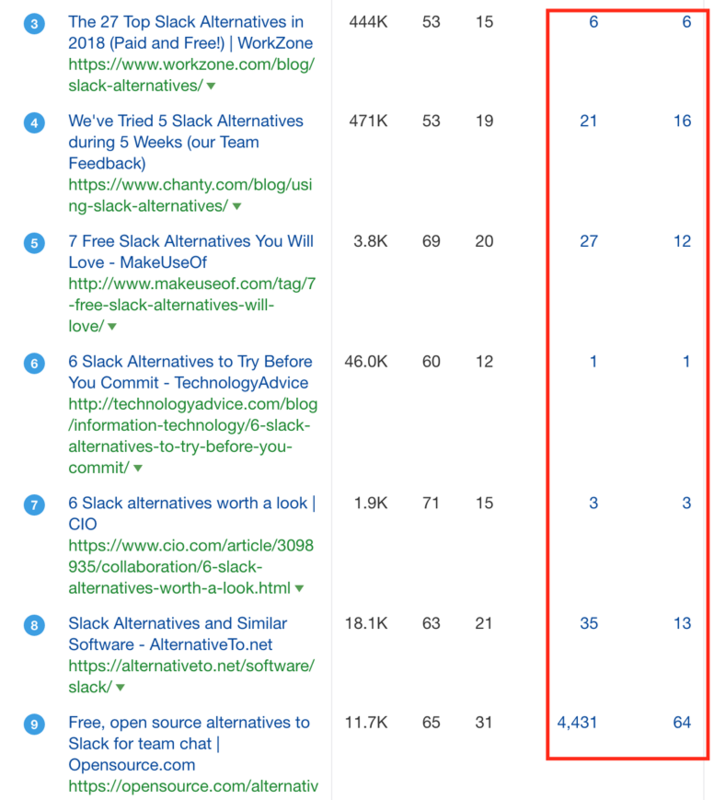 The screenshot below from ahrefs.com shows the first page results for one of our target keywords along with the number of backlinks and backlinking domains supporting each result. You can see that ‘the more backlinks—the higher’ rule doesn’t work in this case. Now it’s RankBrain that determines your spot. And as you already know it focuses on both CTR and dwell time. If you are after a sweet spot in the top results of Google (where, naturally, CTR is higher), you totally need to work on stretching the time visitors spend on your page. How Do You Increase the Dwell Time? Make it ridiculously detailed. In-depth content is more likely to keep your visitors engaged and prevent from bouncing. Take a look at your competitors and work on the piece that’s better in every way—more educating, more insightful. Check if your content is easy to scan. Break it into paragraphs, add headings, subheadings, images, gifs, memes, bulleted and numbered lists, graphs, tables, etc. Add in-article videos. Just think how your dwell time would increase if your visitors spend 2-3 extra minutes to watch a video. Experiment with fonts. The font you are currently using may be hard to read. Why not adopt the successful experience of others? I bet guys at Medium did a lot of research and polished their fonts, font sizes, font colors, and paddings to perfection. Use simple language. Choose simple words, make easy-to-read sentences and combine those into short paragraphs. Putting some of the sentences as stand-alone paragraphs makes your texts easier to comprehend. We’ve done everything we can to make our content as easy to read as possible. We are still far from perfect. Nevertheless, we’ve improved significantly. Decent dwell time along with the higher-than-expected CTR (we’ve started with 3-4% and turned it into 15-20%) led to serious position boost over time. Organic CTR is vital for a reason. It determines the number of clicks to your website which ultimately affect your sales. They say, RankBrain is taking over and will soon become the critical ranking factor replacing backlinks. If you don’t want to be left behind, you should think of user engagement signals today. While backlinks are still valid, it’s time to employ their power to its fullest capacity and get your pages to the top. Once you are on the first page, stand out with your headlines, featured snippets, and personal approach. Make sure the content is worth reading. Educate your visitors and keep them engaged for a long time. Hopefully, my advice helps you increase organic CTR. I’m sure our example is just one of the many islands in the ocean. What about your experience? Feel free to share useful tips and tricks on increasing organic CTR in the comments below.